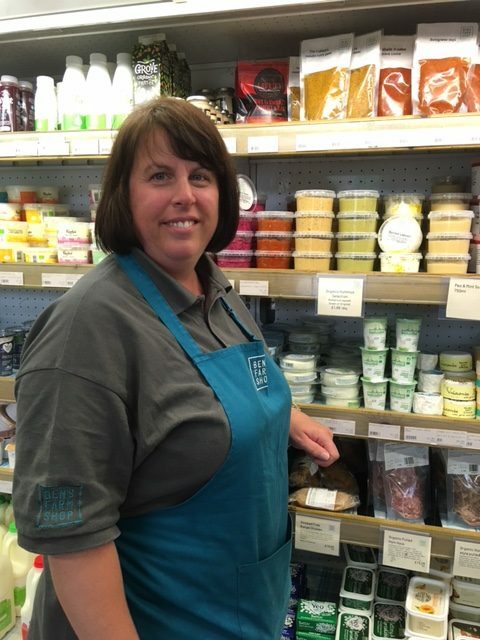 If you’re a regular in our Totnes shop you will see a new face from this week – Charlotte Mulley has just taken over as manager following Ian Taylor’s move to our Staverton shop. Charlotte joined Ben’s Farm Shops in Feb 2016 with a strong retail background. After leaving school in Swindon at 16 she started work for the Burtons group and later moved on to Ponden Mill homes. She also worked for a sandwich chain. Charlotte relocated to Devon in 2007 where she qualified as a school teaching assistant and worked with reception children for many years. “I really love working with people and with customers so when my daughter got older I decided to get back into retail,” she said. Working for Ben’s Farm Shops suits Charlotte’s keen interest in food. “My husband is a triathlete and competes in ironman competitions so we’ve always been really interested in food and he’s very careful about what he puts into his body! I’m a big supporter of buying local food and we love coming to Totnes for the Sunday food market,” she said. Charlotte has lots of plans for the Totnes shop and hopes to entertain you with some new eye-catching window displays.